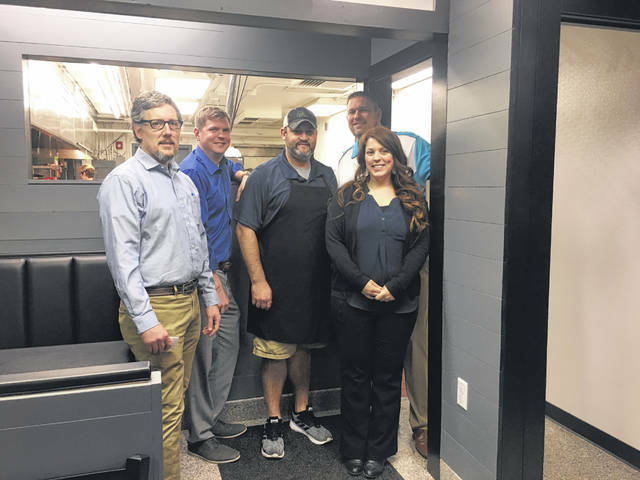 From left are Ty Henderson (Champaign County Library), Eric Warrick (Perpetual Federal Savings Bank), Keith Hardwick (owner of Half-Day Café), Greg Hower (Champaign County YMCA) and Krista Bradley (Darby Dental Smiles). The ILead committee also includes Jamon Sellman (Sellman Insurance Group), Staci Wisma (Chamber of Commerce), Holly McGowen (Mercy Health) and Susie Koennecke ( Chamber of Commerce). The Ilead-Young Professionals of Champaign County welcomed the Half-Day Café, 964 N. Main St., Urbana, to Champaign County by dropping by with Schuler’s donuts and Woodruff chocolate milk. The restaurant is open 6:30 a.m.-2:30 p.m. Tuesday through Saturday. The Chamber of Commerce plans more face-to-face interaction in the community. ILead will be greeting a Champaign County business once a month to show appreciation for the local establishments. In addition, the ILead program is putting together several networking events throughout the year. The first one is on Feb. 5 at Simple Comforts in Mechanicsburg, where there will be several community leaders speaking on the topic of starting their business. Everyone is included, whether you consider yourself a “Young Professional” or young at heart. Those wishing to become more involved in activities with the Chamber of Commerce or interested in serving on a sub-committee can contact Susie Koennecke or Staci Wisma at 937-653-5764. Additional information about the Chamber of Commerce or Ilead can be found on the website, https://www.champaignohio.com, or visit the Ilead Facebook page search: iLead – Champaign County Young Professionals. Submitted by the Champaign County Chamber of Commerce.